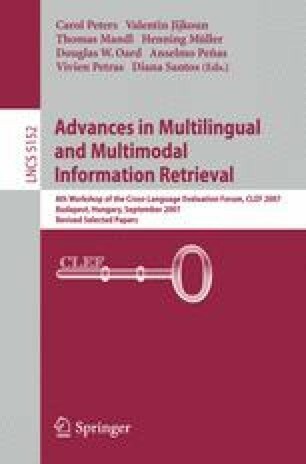 This paper describes the adaptations of the MIRACLE group QA system in order to participate in the Spanish monolingual question answering task at QA@CLEF 2007. A system, initially developed for the EFE collection, was reused for Wikipedia. Answers from both collections were combined using temporal information extracted from questions and collections. Reusing the EFE subsystem has proven not feasible, and questions with answers only in Wikipedia have obtained low accuracy. Besides, a co-reference module based on heuristics was introduced for processing topic-related questions. This module achieves good coverage in different situations but it is hindered by the moderate accuracy of the base system and the chaining of incorrect answers. This work has been partially supported by the Regional Government of Madrid under the Research Network MAVIR (S-0505/TIC-0267) and projects by the Spanish Ministry of Education and Science (TIN2004/07083,TIN2004-07588-C03-02,TIN2007-67407-C03-01). 2.DAEDALUS, Data, Decisions and Systems, S.A.